Nicknamed the Striped Marlin Capital of the World, Cabo San Lucas is ideally situated at the border of two enormous and bountiful bodies of water, the Pacific Ocean and Sea of Cortez, also known as the Gulf of California. 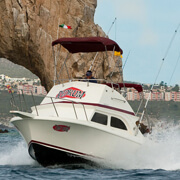 Cabo San Lucas Marina is only a few minutes away from some of the finest light tackleFishing waters on the planet. Deepwater pelagic species like Yellowfin Tuna, Wahoo, and Dorado (known as Mahi Mahi in the Hawaiian Islands or Dolphin Fish in the Atlantic) are drawn from the cold deepwater currents of the Pacific Ocean to hunt for the feeder fish that inhabit the warmer waters of the Sea of Cortez. The waters off the southern tip of the Baja Peninsula also provide excellent fishing grounds for billfish species like Sailfish, Blue Marlin, Black Marlin, and the aforementioned Striped Marlin. The waters off Los Cabos draw world-class anglers to fish for the big money offshore tournaments like the Bisbee Black and Blue. Our knowledgeable captains and mates boast decades of experience fishing the local waters in this deep sea fishing paradise. They have not only run countless successful charters but have also placed highly in many of the international fishing tourneys that are held near Los Cabos annually. Our accommodating charter crews will not only supply you with their invaluable expertise as local guides, but will also provide you with the finest fishing equipment, customized lures, and live bait. We offer a wide selection from our fleet of fine sport-fishing vessels to meet your charter excursion needs. 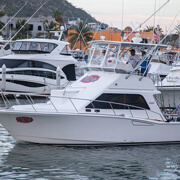 Spacious and fast, El Nuevo, a 33-foot twin-motor Bertram Sportfisher, will convey you and five more friends to the foremost fishing sites around the southern Baja Peninsula. The resort destination of Cabo San Lucas is reputed to be the Marlin capital of the globe. 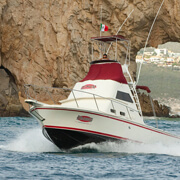 Zoom across the temperate waters of the Sea of Cortez off Los Cabos on the ReelRum, a speedy 28-foot solo-engine sport-fisher. Our government-certified, English-speaking staff is committed to finding the best fishing spots for our clients. You'll enjoy constant bent-rod action aboard the TantRum, a newly-restored and upgraded twenty eight foot California Sportfisher. 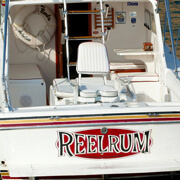 This charter boat has been fully customized and outfitted with state-of-the-art electronic equipment and fishing gear. You will treasure the experience of chasing the pelagic fish off the coast of Los Cabos on the southernmost tip of the Baja Peninsula in Mexico. You and five of your friends can join our experienced captain for a charter on board our 32-foot Crystaliner, the RumRunnin. Call 888-557-3330 now for help finding Things to do in Cabo San Lucas. 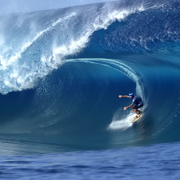 The fantastic surf beaches in the Los Cabos region have been kept quiet by local surfers and wave-riders from So. Cal. Our veteran bilingual guides know where to lead surfers for the best rides. Just south of San Jose del Cabo, the beaches at Costa Azul have especially nice swells, especially from early March through the close of October.